Home / Unlabelled / Lagos state government begings demolition of 57 distressed buildings. 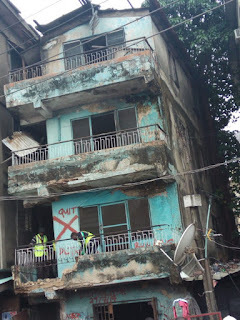 Lagos state government begings demolition of 57 distressed buildings. Thirty-four of the buildings being demolished are on Lagos Island. Officials of LASBCA, escorted by armed policemen stormed the Island in the morning to begin demolition of the affected buildings. General Manager, LASBCA, Engr. Lekan Shodehinde said the demolition was under the first phase of the demolition of distressed buildings approved by Governor Akinwunmi Ambode. Shodehinde said the buildings had been distressed overtime and that government had served owners of the structures notices. He said the exercise was being carried out to stem tides of collapsed buildings in the State, saying that government would not fold its arm and allow buildings to collapse indiscriminately across the metropolis. He disclosed that 13 buildings were being demolished on Monday and that the exercise would last for two weeks. Shodehinde disclosed that the agency had identified 114 distressed buildings that needed to be demolished across the metropolis, adding that the others would be demolished during the second phase of the exercise. He stated that government would no longer wait for owners of distressed buildings to remove them on their own as experience had shown that such owners did not always remove such structures. Shodehinde explained that once a distressed building had been demolished by the government, the owner would be given 90 days to pay the demolition cost, failure for which government would seize the land. He said before a building would be demolished, the owner would be given ample time to remedy the situation, which included subjecting the property to integrity test. The LASBCA General Manager stated that if after the test had been carried out and the property was found to be unsafe, it would be demolished. However, the buildings being demolished ranged from two-storey to four-storey buildings.